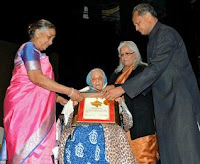 Rajasthan Ratna Award 2012 Winners: Rajasthan Government on March 30, 2012 had instituted 'Rajasthan Ratna' awards for persons who have made distinguished contributions in the fields of art, culture and literature. The function was attended by governor Margaret Alva, chief minister Ashok Gehlot and minister of art and culture Bina Kak and other dignitaries yesterday in Jaipur. As a token of appreciation this award consisted of 1 lakh rupees, shawl, and certificate of appreciation. 1. Allah Jilai Bai (1902-1992) was a folk singer who made the songs “Kesariya Baalam” and “Moomal” identical with Rajasthan. In pre-Independence India she used to sing in the court of Bikaner Maharaja Ganga Singh and was well versed in Maand, Thumri, Khayal and Dadra styles of classical singing. 2. Kanhaiyalal Sethia (1919-2008) hailed from Churu district and made outstanding contributions to Rajasthani literature and culture. His poems gave a peep into rural Rajasthan. 3. Vijay Dan Detha was short listed for the Nobel Prize in literature for his short stories on Rajasthani life this year. His book “Bataan ri Phulwari”, while his short story “Duvida” inspire the Bollywood movie Paheli. 4. Jagjit Singh(1941-2011) gained recognition across the country as Ghazal singer, songwriter and musician. The government of India awarded him Padma Bhushan in 2003. 5. Laxmi Kumari Chundawat is an author and has been a member of the state assembly from 1962 to 1971 and a Rajya Sabha member from 1972 to 1978. She has also received the Padma Shri award in 1984 for her contribution to Rajasthani literature. 6. Vishwa Mohan Bhatt won the Grammy award in 1994 for his album ‘A Meeting by the River’ with Ry Cooder. He is also a recipient of the Sangeet Natak Academy Award (1998) and Padma Shri (2002). 7. Komal Kothari (March 4, 1929 – April 20, 2004), commonly known as Komalda, was an Indian folklorist and ethnomusicologist from Jodhpur, Rajasthan. A pioneer in the study of Indian folkore, he is most known for his work on the folklore of Rajasthan and its links to Music of Rajasthan and its instruments. He founded the Rupayan Sansthan in the 1960, with Vijaydan Detha, an institute that documents Rajasthani folklore, arts and music. For Chapter 7, you'll need to hold back 24 months as soon as the discharge in order to be regarded for the home loan payday uk the most sensible thing that can be done is to have a replica of your credit profile and talk to some financial counselor to get a concept as to once your score may improve. loans, especially to people that do not have access to enough collateral or repayment capacity to remove huge loans. kylie's painful injury - the global economic disease in 8 points as well as the cure in 4 points the hipster techie mental map is the central state too big to fail or too big to survive. and reduce your monthly energy bills. personal credit and business credit.